MCSO says the suspect, Juan Torres, threw the wrench then moved toward the deputies with a hammer. He later died at the hospital. BUCKEYE, AZ — Two deputies from the Maricopa County Sheriff's Office were involved in deadly shooting in Buckeye late Friday night. According to MCSO, a 39-year-old man was shot and killed after throwing a large wrench at deputies and approaching them with a hammer. Two sheriff's deputies responded to a domestic disturbance in the area of 209th Avenue and Narramore Road just before midnight on Friday. The Sheriff's Office says the deputies were met by 39-year-old Juan Torres, who proceeded to throw a large wrench at them. 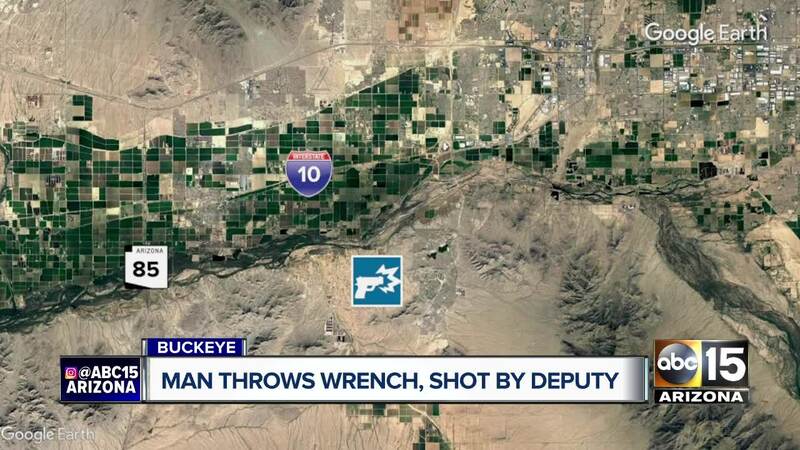 One of the deputies was struck by the wrench and sustained minor injuries, MCSO said. Torres then approached the deputies with a hammer. MCSO says both deputies discharged their weapons, striking Torres. Torres was taken to an area hospital where he was later pronounced dead.